North of the Alps we were rarely given more then a cursory glance; travelling by bike in the Netherlands, Belgium, Germany and Switzerland is nothing to write home about. We blended in. But, welcome to Italy, the country where two girls on heavily loaded bikes with GB flags on are not the norm. When car drivers overtake us, most slow down and follow us with their stare as they pull back in (which involves them looking out of the side window behind them rather than at the road), often with open mouths. Old Italian men seem fascinated by the bikes and the luggage, often chatting away to us in Italian whilst counting the number of bags we have, unperturbed by the fact that we just smile and nod. Mouths drop open when we say we have ridden 2000 kilometres, a phrase even we can manage in Italian. Crossing the Alps was not just a physical boundary between the ‘warm up’ ride to get there and the ‘real adventure’. Life on the road is different in many ways this side of the mountains. 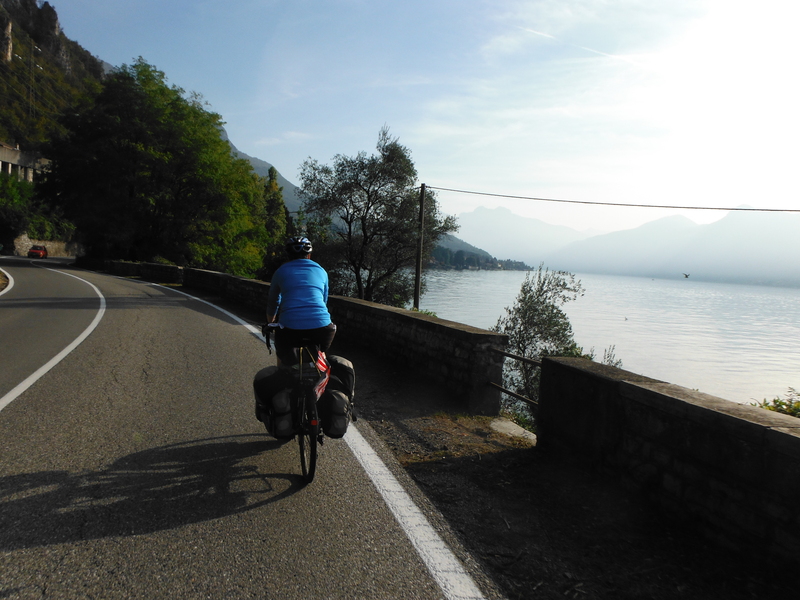 Italy is the first county we haven’t cycled in before, so everything is new. Bike routes are limited so we spend a long time finding routes on quiet roads, only to scrap them later in the day and stick to a bigger straight road in order to get anywhere. The language is almost unknown to us; we are learning the basics but it is hard not to be able to converse with those wide mouthed Italians who greet us in every town and fire questions at us. Road cyclists in full gear fly past all day. Campsites are closed. Also the clocks changing has made our riding day even shorter. But the sun is out (mostly). Also, we are slowing down. Our mission to get over the mountains in search of warmer climates and new places to cycle meant that we pushed on most days, whereas now we are meandering more, joining up places we want to visit, taking a day off here and there. The descent from the mountains took us through Italian Swiss territory, where everyone spoke Italian and the driving became a little more crazy. Italy in everything but the name (and the prices). Our first lake stop was by Lake Maggiore, where we didn’t see George Clooney but with did meet Benardo, a cafe owner (and interestingly the designer of the first electric car) who invited us to camp on his ‘balcony of the lake’. Our tent could not have been closer to the lake shore, a perfect spot to wake up. Dennis from the Netherlands was also camping there and helping Bernardo with his work; Dennis had cycled over the Gotthard Pass too but on a Dutch shopping-style bike in bad weather. Made our ride over look easy. 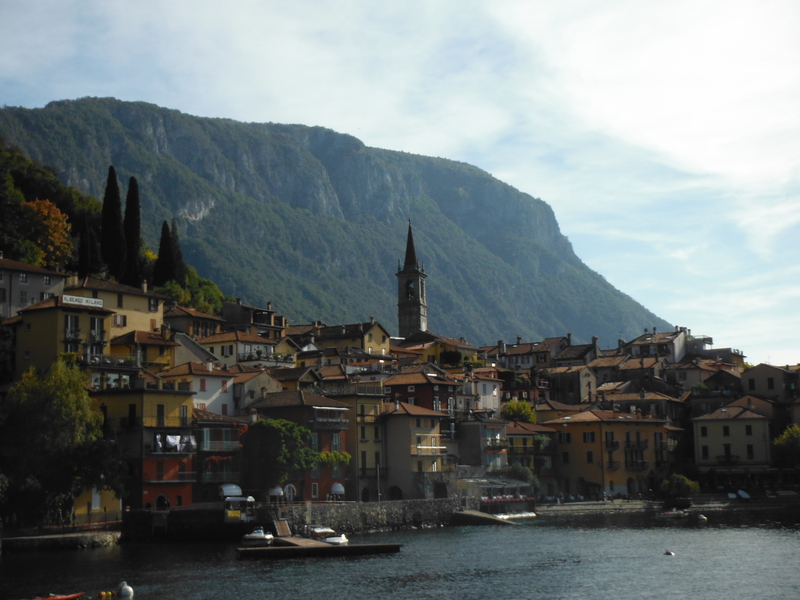 From Lake Maggiore we road east mostly in Switzerland, spending our last francs before staying in Como back in Italy. 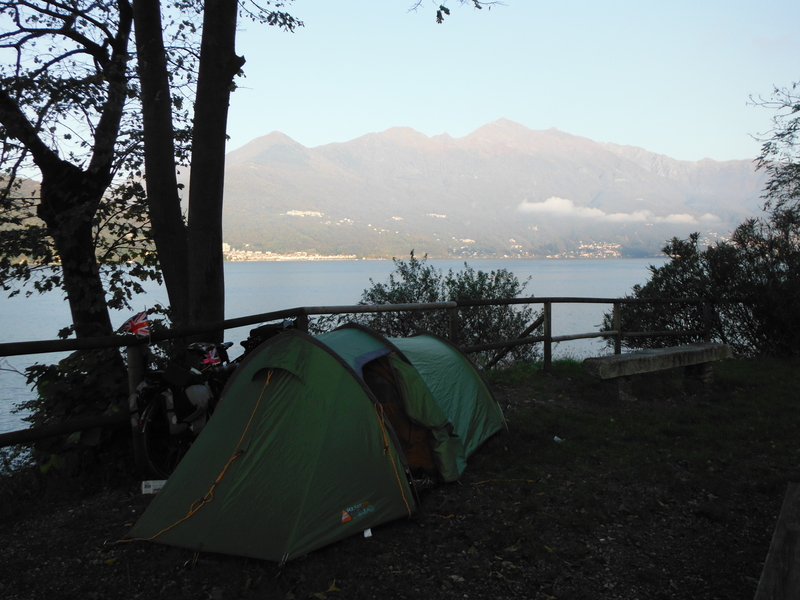 A sunny day was spent riding up and down the ‘inverted y’ base of Lake Como, ending up in Lecco where we actually found an open campsite on the lake. 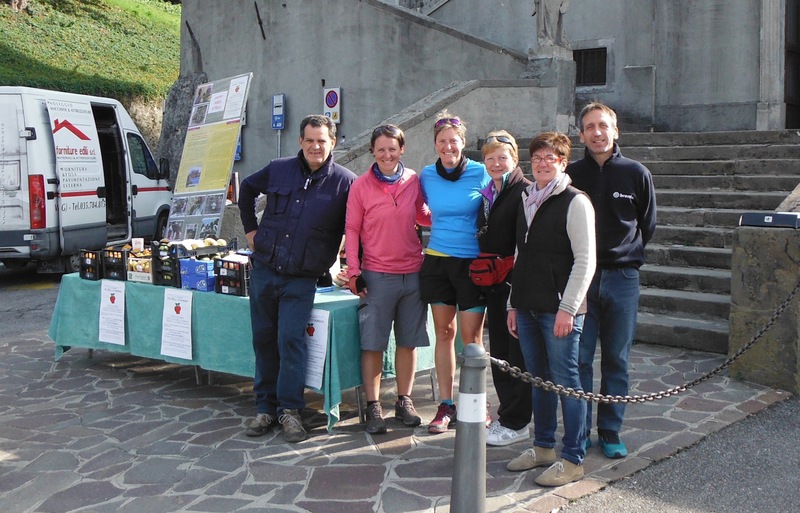 The following day we wound our way through small villages to get to Bergamo. Our route crossed a charity run/walk/bike ride several times – at one point we came across a fundraising stall selling fruit who did the usual open-mouthed gasping at our bikes and journey and then plied us with coffee and cake and filled our panniers (well actually Debs has the food pannier much to my relief) with oranges and mandarins. Bergamo has an old town, ‘citta alta’ on the top of a hill, and riding towards this we were reminded of how great it is to arrive by bike – views emerge slowly and you can appreciate the shift in terrain to get there (although maybe not during the ride up steep cobbled streets, but definitely after). The narrow streets and busy Sunday crowds were a bit of a nightmare to navigate walking the heavy bikes but it gave good opportunity for more staring. After a good look/walk/ride around we rode to the youth hostel up on another hill that had a great view of the old town. We checked in, sneaked our bikes into the room (becoming standard practice for us in hostels) to find that we had our own balcony and amazing view. 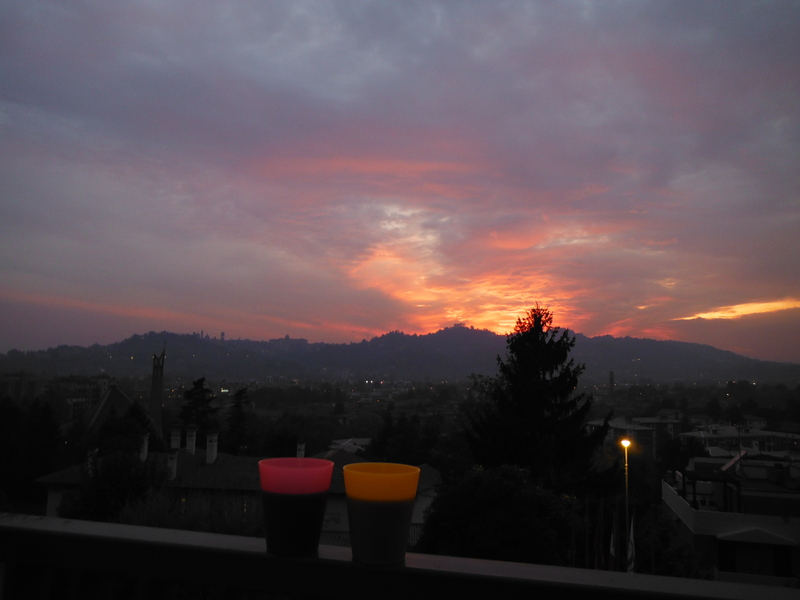 Drinking €2 a bottle (this is not the cheapest) red wine from plastic beakers and watching the sky turn red over the old town, life in Italy was not bad at all.